The good: Maybe One Day touched on so many things near to my heart - ballet, being best friends from a very young age, watching someone you love suffer from a potentially life-threatening illness. There were a dozen emotions expressed in this book that I. just. got. In hindsight (and once the waterworks had stopped), I'll admit it wasn't the perfect book. But its portrayal of feelings like love, friendship, fear and helplessness was so, so right. Zoe and Olivia have been best friends their whole lives - from the moment they met in ballet class as little girls. And like most best friends, they have big dreams of what their future holds for them together. Then Olivia gets sick and everything changes. Their days become a blur of hospital visits, fear of what might happen next, crying, trying to stay strong and to stay them through it all. My biggest takeaway from Maybe One Day is undoubtedly the beauty of their friendship. And it is truly a beautiful thing. I always say there aren't enough positive female friendship books and this one just broke my heart but at the same time, uplifted it because of the love and support they showed one another. The story is told from Zoe's raw and honest point-of-view and even though Olivia doesn't have her own chapters, I felt like I got to know her well through Zoe's eyes. They are two characters I couldn't help but care for and I'm sure anyone reading this book will feel the same way. But despite what was happening to Olivia, it wasn't the only focus of the book. There is some romance as Zoe starts falling for Calvin, Olivia's brother's best friend. The progression of their relationship felt natural. It took up just the right amount of time in the story, without overwhelming everything else. (I have to say - I really, really liked Calvin!) And ballet plays a huge role too. It's what brought Zoe and Olivia in the first place and it continues to be a driving force in both their lives. Just reading about the passion and feeling dancing gave them made think about the last time I felt that way. (Some) reservations: My biggest fear going into this book once I realized what it was about was that I would constantly compare it to A Time For Dancing by David Wills Hurwin (a.ka. one of my favorite books ever). And unfortunately, that is exactly what happened. 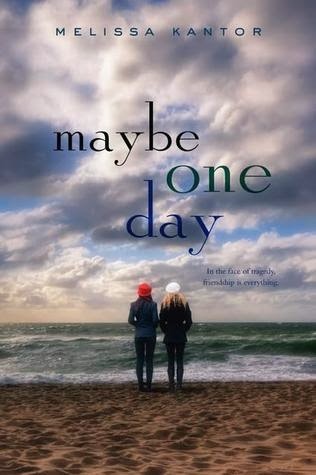 It didn't stop me from enjoying Maybe One Day (because I did!) but the other book was always in the back of my mind especially since there are a lot of similarities. Do I recommend? : I do. It's definitely a tearjerker and if you want a solid friendship book, I recommend checking this out. Maybe One Day sounds like such a great novel and I love how it focuses on friendship, especially since I've had so many friendships that have helped define me as a person. I try to stay away from cancer novels since they hit so close to home but Maybe One Day sounds like something that I should read especially since it's not just a cancer novel.